Prolight & Sound 2012 marks the unveiling and preview of the new HARMAN Soundcraft® ViSi Remote iPad app, which enables a single iPad to control multiple consoles from the Soundcraft Vi Series™ and Soundcraft Si Compact range on one wireless network. The app uses HARMAN’s HiQnet™ architecture to connect a network of consoles to a wireless router, which communicates with the iPad. 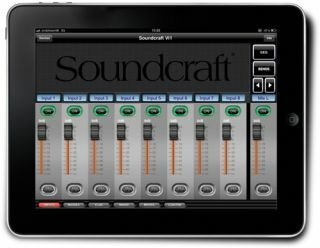 The Soundcraft ViSi remote is expected to hit the iTunes store at the end of April 2012, and by pre-registering on the Soundcraft website users will not only be informed immediately when the app goes live, but will be entered into a prize draw to win an Apple iPad. (conditions apply, see website for details: http://www.soundcraft.com/apps/visi-remote). Apple and iPad are trademarks of Apple, Inc., registered in the U.K. and other countries.